Tech titans know that if they want to expand their customer bases, they’ve got to get ’em while they’re young. That’s why Google and Microsoft have targeted teachers and younger students with special editions of their bread-and-butter software packages. The idea is if you learn to type on Microsoft Word or Google Docs, you’ll keep typing and working on one of those options for life. That’s the rationale behind the companies’ respective Google Classroom and Microsoft Classroom franchises. With this in mind, the battle for dominance in classrooms across the country makes a lot more sense. Apple Inc. (NASDAQ:AAPL), which has been battling Microsoft in classrooms across America since the release of its Apple IIe desktop computer in the 1980’s, was in a solid position to maintain top market share with the iPad release in 2010. 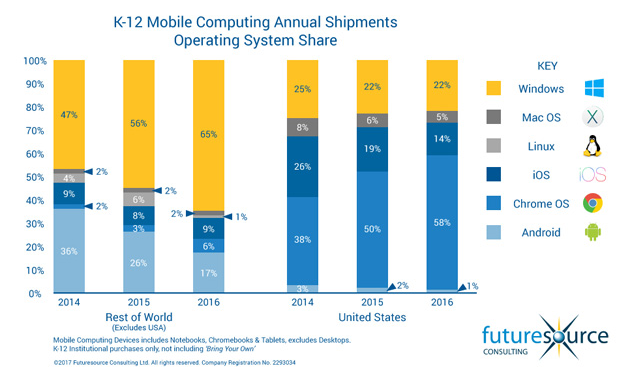 Almost immediately, the iPad became a nationwide hit with teachers and students alike, and by 2013, Apple devices accounted for nearly half of all shipments to classrooms, while MSFT devices only accounted for 29%. And so the war waged on, as it had for more than three decades prior, with AAPL and Microsoft vying for the attention of America’s pupils in hopes of establishing a lifelong brand loyalty by putting their devices in classrooms across the country. Meanwhile, all along GOOGL had been laying the groundwork for making further inroads into educational institutions by marketing Google Apps for Education, which integrated with Google Drive and Gmail. GOOGL rather quickly disrupted what had traditionally been a solid duopoly — like it had done (and continues to do) with a number of other services — and rose to become the top dog, rocketing past the competition thanks to a few key elements that, together, were much more desirable for both students and educators. While Apple and Microsoft focused on marketing their hardware, Google had realized that students and teachers were still using its cloud platform to create, share and collaborate, regardless of the device they used to access its cloud services, hence the introduction of Google Classroom. With development of the functional, yet extremely inexpensive, Chromebook device, which provided for extremely easy access to the web-based applications that the bulk of students and teachers already used, it was no surprise when GOOGL amassed a 58% market share in early 2016. While it’s no secret that many consumers, investors and analysts alike frequently tend to view MSFT as “old school” and GOOGL as the better, more modern technology company. However, not everybody feels this way, and there’s no denying that Microsoft has the experience and resources to remain a major player in the tech industry. The question, though, involves finding the most potentially profitable areas for future development and growth of MSFT stock. 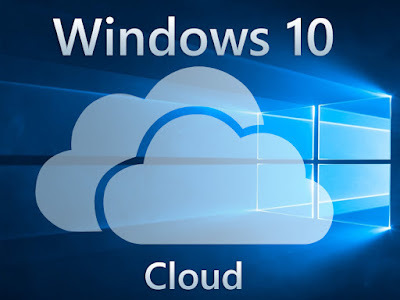 According to Windows Central, “the timing is right for Windows 10 Cloud.” Apparently, management has learned from the Windows RT debacle and has a new strategy in place to properly and successfully market Windows 10 Cloud as a viable alternative to Google and its line of Chromebooks. If the company can gain traction and start chipping away at Google’s market share, that could translate into solid long-term support for MSFT stock. Unfortunately, it will be many months before anything concrete is available, and even those figures will just be preliminary. It could take at least a year before any meaningful earnings and revenue figures are released, which is what will ultimately be the driving force behind a change for Microsoft stock. Of course, don’t expect Google to merely sit on its laurels, either. The company is no stranger to competition, and openly encouraged innovation is a unique part of the company culture. It’s less likely, though, that GOOGL stock will experience effects as powerful as MSFT stock, simply because Google’s structure does not need successful PC/tablet sales to remain profitable. Keep an eye on the Microsoft Spring Hardware event next week, because if management can make an impressive display of Windows 10 Cloud, there’s a good chance that teachers and students will also be receptive.